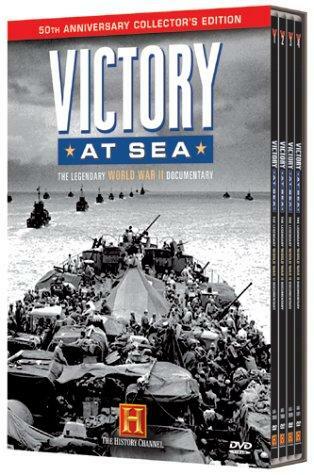 Twenty-six episode series about naval combat during World War Two. Famous for its music score, eloquent narration and combat footage. This is a beautiful piece of TV. I would not shell out on a 6-vol DVD if I thought otherwise. I saw it on BBC in 1960-61. 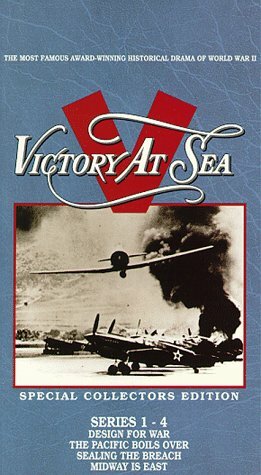 But, looking at it 45 years on I feel it should be re-titled 'Victory in the Pacific' - I mean, there was some sort of war going on prior to Dec 41, and a lot of it at sea! OK, so the program makers did give that 25 minutes, but then gave Pearl Harbour another 25 minutes. And - those planes look a little like US planes with a 'rising sun'painted on. And one of those ships that blew up off Guadalcanal seems to be the same one that was hit by stukas 5 miles off Dover. He was also one of those that was hit off Anzio! That captain must be getting real sick! And all that underwater salvage work at Pearl Harbour gives the real impression that the fleet was salvaged (phrases such as 'raised from the deep'). Whatever the case, the Arizona wasn't one of them. For all this, it is beautiful TV. As history, may be 6/10. But, then for entertainment, watch the film. For accurate history, read the books! Nick Baker, South Darenth, Kent UK I just found the entire 3 DVD set at Wal-Mart in the bargain bin for $5.50, so I thought I would take another look. Total of 13 hours to watch it all (26 episodes). I was born in 1948 and saw most of them on TV in the sixties. Many independent stations repeated them for many years. Better than I expected actually, time has been kind to the obvious sincerity of it's creators, and to the obvious gratitude and respect they give to all the Allied fighting men and women. More abstract and arty than a straight forward documentary, but very truthful in it's depiction of the causes and final results of WWII. That war was greatly dependent on sea transportation, and the final victory was dependent on who achieved the final mastery of the world's oceans. The Allies were the ones who were able to do it. Interesting too, to see how they try to strike a balance between big events, and the individual soldiers and sailors that made them happen. The score is impressive, if a bit too much by today's standards. I read somewhere that Robert Russell Bennett contributed just as much as Richard Rodgers to final score. I imagine that Rodgers provided all the major themes, and it was up to Bennett to fit them to the images. Great job! Should be seen by every ruler, or potential ruler. A warning to tyrants that wars are eventually won by ideals, determination, and the supplies to back them up. Logistics: their quality and delivery will determine the eventual victors. The Allies outproduced and surpassed the material quality of the Axis, attacked their very source in the process, and insured their eventual defeat. Trivia: I had all 3 LP records made of the background music, pretty good overall. Unfortunately, the producers decided to add sound effects to the last one, relegating immediately to just novelty status, rather than for serious music listening. Too bad too, because it contained some interesting but more minor themes in the series. Silly stuff like 16 inch guns firing, torpedoes being fired, bulldozers, planes...just for kids mainly.